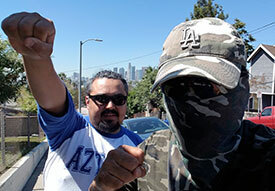 Militant Angeleno: Native Month: Know Your "Na!" Native Month: Know Your "Na!" Yesterday's first installment of Native Week gave you a profile of the Real Los Angeles Natives - The Tongva Native American tribe. Today, The Militant will show you where they lived. We now know Los Angeles (the region) as a bustling metropolis megalopolis of some 15 million people - larger than the population of nations like Ecuador, Guatemala or Cambodia (!) And rightfully so -- this was a nation. The Tongva was also surrounded by other nations - the Chumash (Ventura and Santa Barbara counties), the Tataviam (North San Fernando Valley and Santa Clarita Valley), the Cahulla (eastern Inland Empire) and the Payomkuishum (North San Diego County). This map was done with much Militant research, but it is no means comprehensive. There were more villages, whose names escaped documented hustory. Some of the locations are generalized and not precise. Of course, the Tongva nation wasn't nearly as populous - it only had somewhere between 5,000 and 10,000 people. By looking at the map, you would notice a few things. First, the densities of the villages. Unlike modern Los Angeles, which has its development and poulation centered around Downtown Los Angeles and the area slightly to the west of it, the villages were largely located along the rivers (from west to east on the map: Ballona Creek (which once connected with the Los Angeles River during certain seasons), The Los Angeles River, The San Gabriel River and The Santa Ana River). There were also large swaths of nothingness, mainly because, there were no natural resources (water source, farmable/huntable land) to take advantage of.The Tongva, being a seafaring people, also lived along the coast (Yes indeed, they before anyone else knew the value of beachfront property). There are also a large accumulation of villages (exact locations estimated only) clustered around the San Fernando and San Gabriel areas - of course, those are where the Spanish settlers established the Missions. Second, though most of these names sound strange and exotic, some of them sound very familiar, and rightfully so -- their present-day names were Hispanicized versions of the original Tongva village name. Places like Cahugna (Cahuenga), Topagna (Topanga), Tuyunga (Tujunga), Azucsagna (Azusa) and Kukamogna (Rancho Cucamonga). Lastly, most of them end with the letters "-na" or "-gna" (That was too weird sounding for the Spaniards, so they pronounced it "-nga"). That suffix meant, "place." These days, people ask you, "Where you from?" or "Where you stay?" The Militant asks, "Where's your na?" Can you spot your neighborhood or city on the map? Do you know your Na? Glad to see the proud name of Cucamonga gettin' some respect. I lived out there for 5 years and got tired of people thinking Mel Blanc invented the place as a Jack Benny routine! Don't feel insulted...they brought a Tongva place into mainstream culture! Awesome work. This could end so many local name disputes if we just reverted to the original names. Walt: Truly. The Tongva NEVER cared about this so-called "Westside-Eastside" dichotomy, which was introduced by 20th century and latter colonists. By the way, most of my (rather cursory) research into Tongva place names suggests that the usual place-name suffix was "[...]ng-na." Topang-na, Tuhung-na, Kaweng-na, and so on. The "[...]ng-na" sound sequence is unusual in Spanish, so most of the Spanish transliterations dropped the second 'n'. I've always wondered where "Temecula" came from...and I wonder if Siutcangna, close as it is to the original outlines of the annexed city of Owensmouth aka Canoga Park, inspired the "Canoga." Very very cool. Did you find any Chumash sites? lucindamichele: Temecula is derived from a Payomkowishum place name called "Exva Temeeku." The Pechanga are part of this tribe. As for Chumash, The Militant hasn't studied them as much, but there are lots of similarities with the Tongva, especially in their language, houses and boats. Malibu came from a Chumash village called "Humaliwuw." Excellent post. There was also a village called Otsungna or Otsurgna "The Place Of Roses" in the community now known as El Sereno. There was (IS) a perennial stream that runs through the area-the 710 now occupies this arroyo, the perennial stream still runs along concrete channel on the south side of the 710. One of the first adobes in the state was built in the same area of the village in 1776--probably because of the water source AND labor source of the Tongva village (Cal State LA occupies the area where the adobe and probably the native village of Otsungna once stood). The El Sereno Historical Society has more info on their website's- archive page. Thanks for the great research. I started researching the Tongva Indians after reading the article "The Los Angeles Prairie", by Paula M. Schiffman, for a class I am taking. I am impressed by the work you've done about them. I really like the map youve created. Where did you find your sources for locations these villages? ongva is a bunch of CRAP. They are a made-up tribe from the early 1990's. The person who made up this name is Cindi Alvitri. She wrote in a CSULB newsletter in 2008: "tongva is what we call ourselves in the present.....never was there a tribe called tongva." You will find NO historical data on the tonguevas prior to 1990. Everything written is post. The picture you have of Chief Red Nose is not even Native American. Yet to be exposed, we have a certified genealogy research of Anthony Morales he is NOT NATIVE AMERICAN. In fact there is documented genealogy reports on Cindi Alvitri, Mark Acuna, the Dorame's, Matthew Lovio, the originators of tongueva, who claim to be Native People who are NOt. The true Tribe of the greater Los Angeles/Orange County Basins are the Gabrieleno Indians, KIZH Nation. You can find the truth at www.gabrielenoindians.org.